Stormwater runoff is now the leading cause of impairment to Ohio's streams and waterways. Agricultural drainage—sediments and chemicals—is a major source of this impairment. However, nonpoint source (NPS) pollution from urban impervious surfaces (i.e., parking lots, roadways, sidewalks, rooftops, etc.) is also a major contributor. Parking lots collect grease, oil, antifreeze, and other vehicle leakage; heavy metals from brake dust; as well as litter, other debris, and pathogens. All of these pollutants are flushed into waterways by rain and melting snow. In addition, impervious areas hasten the movement of stormwater runoff across the surface, into a series of curbs, gutters, drains, and pipes, increasing flood occurrence and stream bank erosion. State laws, as well as some local ordinances, now mandate that detention areas be constructed to detain excess runoff from large parking lots. These offsite, rock-edged basins are often unattractive, unsafe, and wasteful of valuable property. In addition, federal regulations require most urban communities to reduce the amount of polluted stormwater runoff. One relatively low-cost1 alternative to separately built, highly engineered, and questionably effective detention ponds is to integrate the absorption of parking lot runoff into landscape islands. Commonly known as "bioretention" areas, these landscaped islands treat stormwater using a combination of microbial soil process, infiltration, evaporation, and appropriate plantings.2 Instead of the typical landscape islands that are set higher than paved grade (and which often require supplemental irrigation), these "biofiltration" or wetland landscape islands are recessed, and the pavement is graded so that surface flow is into, rather than away from, these areas. N/A indicates that data is not available. Adapted from: Winer, Rebecca. 2000. National Pollution Removal Data Base. Center for Watershed Protection, Ellicott City, MD 21043. Even in small parking lots where there are no landscape islands, biofiltration of stormwater can be achieved through the diversion of the stormwater runoff to a landscaped area at the perimeter of the lot. In addition to bioretention areas, two other options—sand filters and/or grassed filter strips—may be considered for perimeter applications. The use of subsurface drains (under-drainage) is optional for both the islands and perimeter systems, depending on conditions of the particular site. Subsurface drains may also be designed to deliver water in times of drought. Along with reduction of surface water flow rates and pollution loading, additional benefits of bioretention areas in parking lots include storage of snow from winter plowing and groundwater recharge (if tile drainage is not installed and infiltration is allowed to occur). One caveat is that bioretention islands and perimeter swales may not provide complete "quantity control," or capacity for retention during heavy rainfall. This may require the use of "shunt" pipes to bypass the biofiltration system and discharge the excess stormwater runoff directly into perimeter swales or conventional conveyance systems. Such bypasses may be designed to handle the 5- or 10-year storm event and may require the use of an additional infiltration or detention basin to meet the local discharge requirements. Drainage can actually be used as a design element. 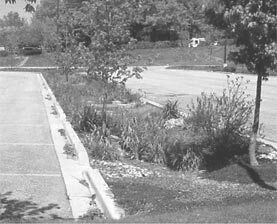 Optimal minimum coverage for the bioretention areas is five percent of the entire paved surface. Proper engineering, design, and construction of these landscape features are mandatory, and their maintenance requirements are a little different from the normal parking lot landscape island. However, with appropriate plant selection, these small-scale plant communities can be almost self-sustaining and require less upkeep than a typical landscape bed. As with any installed landscape, proper plant choices are essential to the long-term success of landscape islands. Trees must be able to withstand both drought and periodic flooding of their root systems, and they should be deep-rooted. Trees should neither drip sap on vehicles nor have large or messy fruit. If possible, trees that shed large, persistent leaves should be avoided in favor of those with small leaves that biodegrade quickly. All shrubs and herbaceous perennials used under trees in bioretention islands should be shade tolerant and, if winter salting is the norm, salt tolerant. Shrubs and perennials must be attractive at close range; weedy growth or sprawling habit can make the landscape appear unkempt. Evergreen leaves and showy flowers are a bonus. Maintenance for bioretention landscape islands is not much different from that required for a standard landscape island: annual testing of soil pH, mulching, inspection of plants for pests, pruning for shape and vigor, and regular litter removal. The specification of flood-tolerant woody and herbaceous perennial plants will ensure that any intermittent flooding is a benefit rather than a threat to plant health. If balanced combinations of both evergreen and deciduous flowering trees, shrubs, and herbaceous perennials or groundcovers are used, these plants can help turn the potential eyesore of detention basins into an asset for any public landscape. 1. The Stormwater Management Fact Sheet: Bioretention (http://www.stormwatercenter.net) refers to these systems as relatively expensive. However, costly landscaped areas and under-drains are often normally included in parking lot design. Bioretention areas can either eliminate or reduce the size of detention ponds, and combined with the environmental benefit that can be realized, the overall cost is relatively low. 2. Bitter, Susan D., and J. Keith Bowers. 2000. Bioretention as a Stormwater Treatment Practice. The Practice of Watershed Protection: Article 110 548-550. Better Site Design: A Handbook for Changing Development Rules in Your Community. 1998. Center for Watershed Protection, Ellicott City, MD. Brown, W., and T. Schueler. 1997 National Pollution Removal Performance Database for Stormwater Best Management Practices. Center for Watershed Protection, Ellicott City, MD. Claytor, R., and T. Schueler. 1996. Design of Stormwater Filtering Systems. Center for Watershed Protection, Ellicott City, MD. Design Manual for Use of Bioretention in Stormwater Management. 1993. Prince George's County Watershed Protection Branch, Landover, MD. Operation, Maintenance, and Management of Stormwater. 1997. Watershed Management Institute, Inc., Crawfordville, FL. Start at the Source. 1997. Bay Area Stormwater Management Agencies Association, Oakland, CA. Written by Martin F. Quigley, Assistant Professor, Urban Landscape Ecology, Horticulture and Crop Sciences, Ohio State University and Timothy Lawrence, Program Director, Ohio NEMO, Food, Agriculture and Biological Engineering. Reviewed by John Rozum, National NEMO Network; Laurie Giannotti, Connecticut NEMO; Jim Gibbons, University of Connecticut Cooperative Extension; Jennifer Zielinski, Center for Watershed Protection. This fact sheet was originally published by Ohio State University Extension (publication number CL-1000-01) and was funded in part by a grant from USDA/CSREES (project award number 99-EWQI-1-0617). It is reprinted here by permission.